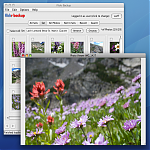 FlickrBackup is an Open Source project that is hosted on SourceForge.net. Feel free to check out our project page. On the project page, you can submit and review bug reports, request features for future releases and much more. 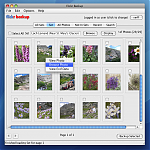 An example of the main view in FlickrBackup. This is the view of the All Photos. Notice the new paged view when you have many photos. 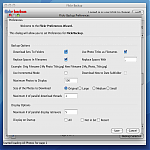 The Download Dialog where you choose where to download your photos to, compression, etc. While download, this is the progress view for each photos and the entire set/photos(s). The Set Browser allows you to load the photos from a single set. Double clicking on a set in the All Sets view will load the set into this view. View your Photos EXIF data right from FlickrBackup! View Photos right from FlickrBackup! The Contextual Menu on Photos now allows you to view photos, browse photos on flickr, and view their EXIF data.